It’s a new game, is a new sport for a different educational reality. We called a fusion sport because it takes standards, rules and hints of popular sports like: Ping Pong, Football, Volleyball and Tennis. You can use any part of the body: feet, hands, head and we can directly hit the ball to play with teammates or wait for the ball to bounce on the ground only once between hit and hit. It is a simple, fun game when it’s played in groups from 7-20 players, and very competitive with teams of 4-5 or 6 players. I encourage you to play. How should the playing field be? It should be a flat surface; it may be albero, cement and in the best case parquet or laminated flooring. The field measurements depend on the number of players. Multi Sports court 40 m long and 20 m wide (teams from 11 to 20 players). How to score a point? -the team hits the ball more than three times. -by invading the opposite field above or below the network. -to change a player from one area to another without having finished the SET. It is made of rubber foam, soft texture, weighs little and has a nice bounce. Its circumference ranges between 60-70 cm and they can be found on the market on wide range of colors. The ball can hit different parts of the body (feet, hands, head) but a player can never hit the ball twice in a row. 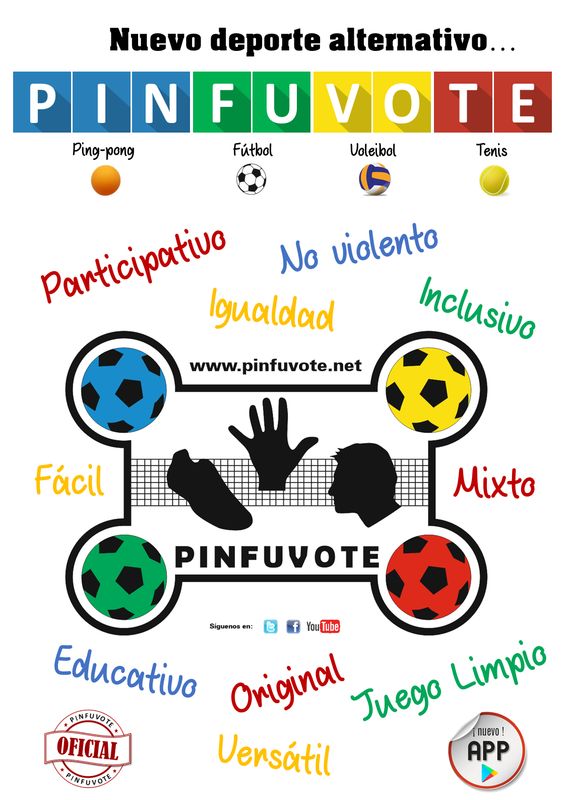 In PINFUVOTE it is allowed a maximum of three strikes. You can hit the ball directly or wait for the ball to bounce on the floor between each strike. When the ball bounces on the line limits it is considered valid. The posts that hold the net serve as reference of the ball during the game. The net can be touched by the ball during the match, except in the service. In that case you must serve again. The player always makes the service from a central circle keeping both feet inside it; jumping in the service is not allowed. In the service the ball must pass over the net without touching it. In the case that the ball goes over the net but touches it, there will be a second chance to play the service; as happens in tennis or table tennis. -kicking directly the ball in the air. -kicking after dropping the ball and bouncing on the floor. -with one hand like in handball. -with the hand high making a tennis serve. -with the low hand low performing a safety throw. Remember that players are free to move within the same area during the game SET, but once it has finished you may choose to change the area, according to the guideline of the coach, who will facilitate the list, or any changes. Punctuation. The punctuation… How you win a game? It is similar to volleyball, therefore a team wins when they win 3 SETS. A set is equivalent to 25 points and there will always be a difference of 2 points. It will be played a maximum of 5 SETS if the game is very disputed, with the difference that the last and fifth set is worth 15 points. Possible results in a game could be: 3-0/ 3-1/ 3-2. When the team that has possession of serving wins 3 consecutive points, there will be a change of players, front and rear lines, on both teams. Such action will be indicated by the referee. In the case of violation of this rule, such action will be indicated by the referee. It will be considered a fault and the referee will give the point to the other team. having made After the change of lines, the team who served will throw again but this time it will be another player. This rule is intended to encourage the game. When 3 different players hit the ball with 3 different parts of the body (such as foot, hand and head) in the same action and they win that point they are awarded with a tripin, counting 3 points for the team. These notes are reviewed and translated in March 2014.